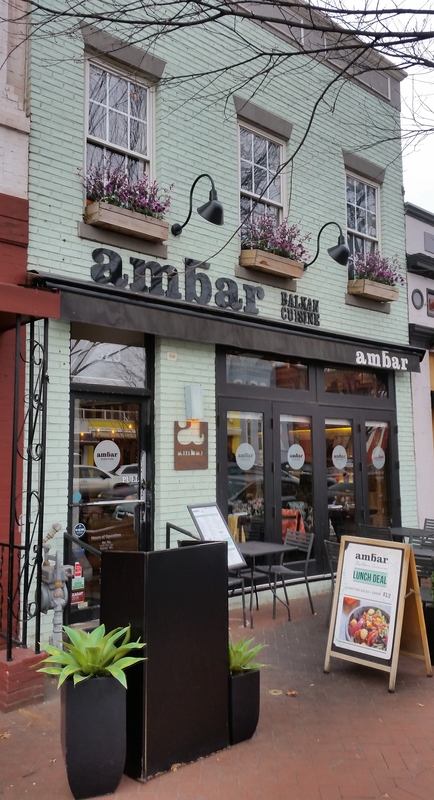 Ambar on Barracks Row. A repeat offender according to ANC ABC Chair Chander Jayaraman. 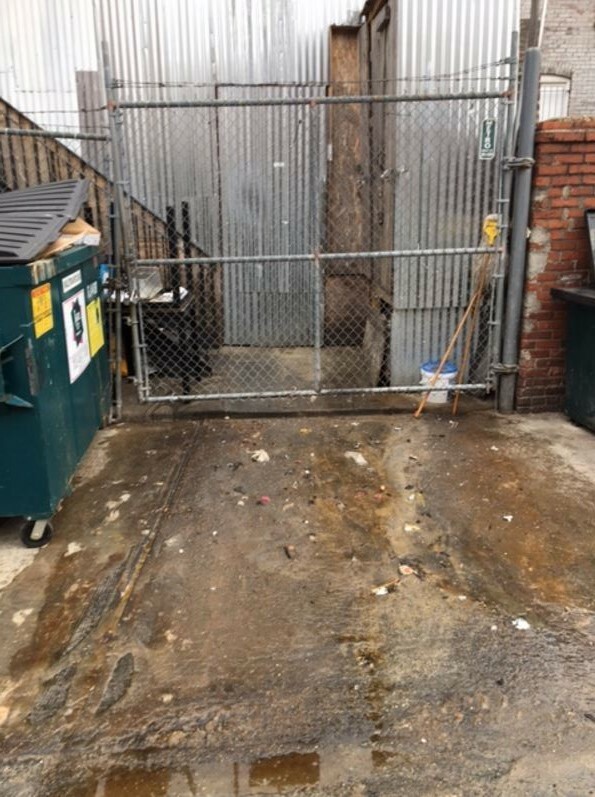 Photo taken this morning of the grease and food waste dump in the alley behind Ambar. The dump turned the alley into a grease run. 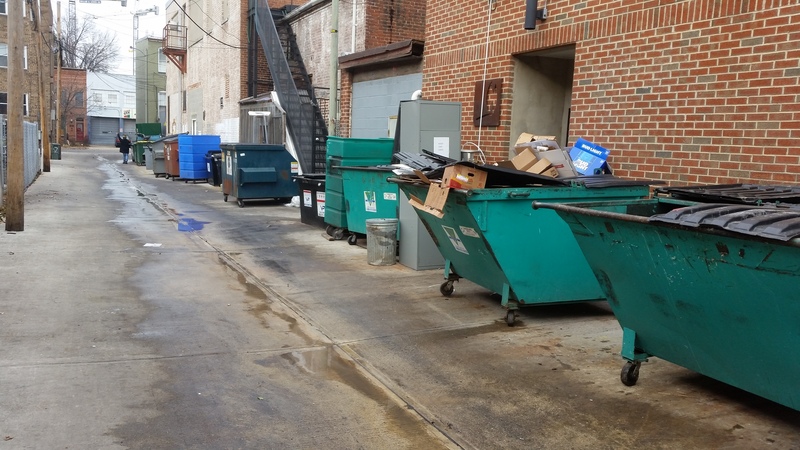 View of the alley abot 3:00pm after complaints caused the restaurant to clean up the mess – which ended up in the Anacostia River. The attention caused nearby restaurants to take a look – at least temporarily – at their own parts of the alley. 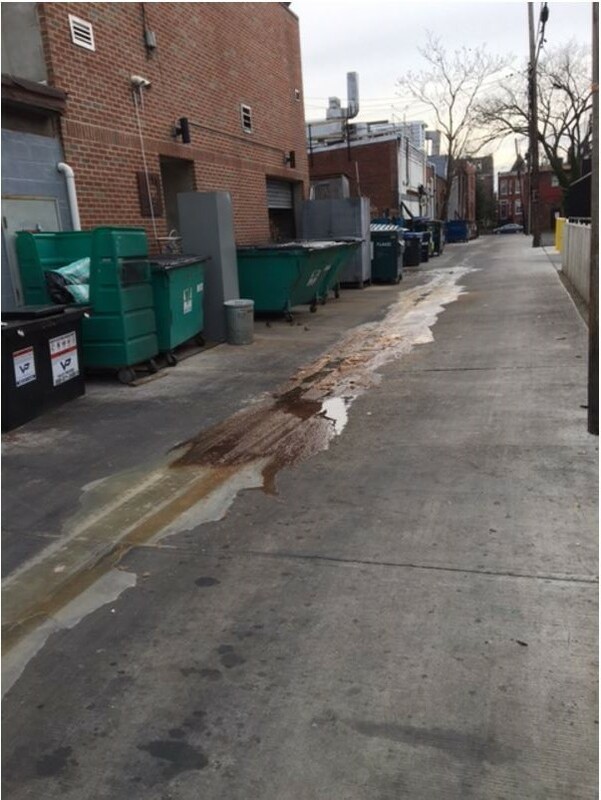 An across-the-alley neighbor of Ambar, set off alarm bells this morning when he circulated a set of photos of “grease, liquid food waste, and other foods” dumped either accidentally or intentionally in the alley behind Ambar on Barracks Row. 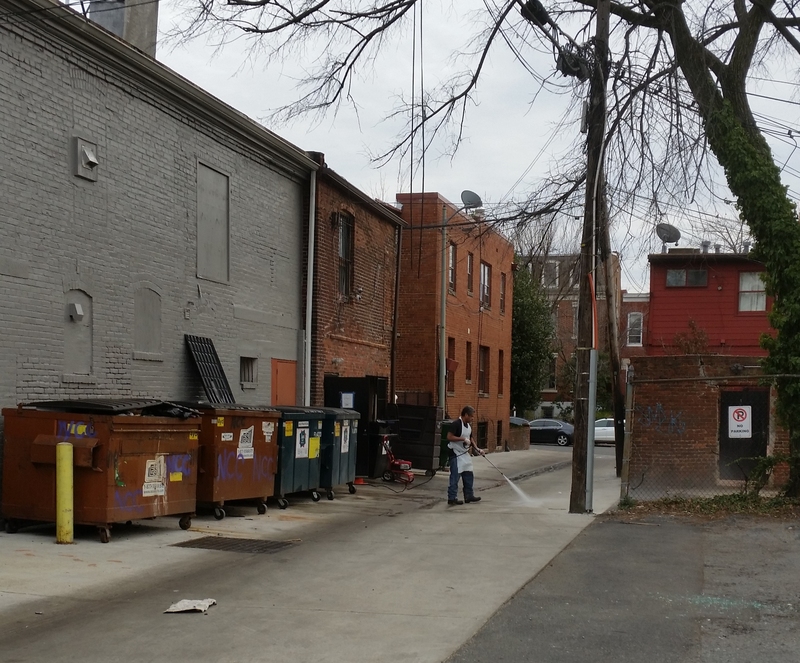 The response from the community was fury over this latest in a long series of complaints about conditions in the alley behind restaurants on the west side of Barracks Row. Initiate a campaign to publicize the issue, naming the offending restaurants, and contacting the restaurant ownership. Neighbors agree that a legal ban on storage of grease on public space is a good first step toward indoor storage of trash, recycling, and grease. But virtually all of them think that more needs to be done. To that end, mandatory indoor trash, recycling and grease storage is the necessary next step. The success of & Pizza and EatBar are good examples showing that these best operating practices work. I walked by here on both 8th and 7th today and it really stinks of fried grease. I didn’t see the alley, it smells all the way to both sidewalks. Another and larger cause of the odor is the grease and food particulate that is released into the air by the kitchen exhaust fans of nearly every restaurant on Barracks Row. This unfiltered exhaust is not only a nuisance, it is a known rodent attractant, according to DC rodent expert Robert Corrigan. & Pizza and EatBar are the only restaurants on the Hill that have mitigated the odor and removed the grease and food particulate through installation of pollution control units (PCU). When engaged by neighbors and the ANC, the owners of these restaurants joined our effort to address the environmental and health issues that come with dense restaurant development. They are the exception. More typical is Medium Rare. After much work on the part of the ANC, Medium Rare, which has had a number of alley grease-spill incidents in the recent past, agreed in its liquor license settlement agreement to install heavy-duty kitchen exhaust filters. The goal was to see if this less expensive alternative to a PCU would mitigate the strong odor of the Medium Rare’s grease-heavy steak and fries menu. (Experts consulted by the neighbors don’t believe the filters will be effective, but the neighbors nonetheless supported the compromise experiment.) Six months ago Steve Abramson, General Counsel for Medium Rare, agreed to give neighbors and representatives of the DC Dept of Health, the Mayor’s office, and the ANC an opportunity to see the filters in action — as soon as he could get permission from Medium Rare owner Mark Bucher. The tour never happened and follow up emails have gone unanswered. Neighbors and the ANC have worked long and hard to explore all options for dealing with the environmental downside of dense restaurant development in older historical neighborhoods. Unfortunately, many of the restaurateurs in the area have made it clear that they think the public health and nuisance problems that they create are a cost that residential neighbors and non food businesses should bear in exchange for for the privilege of their presence.